International UFO Congress goes Online! We at the International UFO Congress are proud to announce the opening of our online store at www.ufocongressstore.com We currently have the last 3 years' events on the site, and we will be adding all events over the next month. We have marked down all our books 25-60% off! Attend the next International UFO Conference and Film Festival! The conference schedule is almost complete. The final schedule will be posted to the website shortly and we will notify you by e-mail when we are ready to process registrations. If you would like to be added to our mailing list to receive a brochure please e-mail us at ufocongress@msn.com. While an endless number of stars were shining in the deep sky of Nevada, other stars were shining at the Flamingo Resort Hotel during the 14th Annual International UFO Congress in Laughlin, Nevada on March 6-12, 2005. Those are the stars who dedicated themselves with body and soul to investigate the biggest secret of our planet: the UFO reality and the existence of extraterrestrials in our world. This year, as a Turkish-American UFO Researcher and Associate Producer of the Jerry Pippin show, I was proud to represent my native country in this wonderful event organized by Bob Brown. Bruce Moen, Dr. Richard Boylan , Dr. Thomas Van Flandern, Jim Marrs, Sean David Morton, Tom Valone, PhD. Dr. Rudy Schild, Willam Henry, Dr. Simeon Hein, Michael Salla PhD, Donald Ware, Freddy Silva, Len Horowitz, Dolores Cannon, Jaime Maussan (Mexico), Joe Lewels, Barbara Lamb, Ann & Jason Andrews, Steve Jones, Wendelle Stevens, Ron Russell, A.J. Gevaerd, Dr. Roger Leir, Paola Harris, Charles Hall, Dr. Nick Begich were the renowned speakers. The international profile of the speakers shows one more time that the UFO reality is not limited by borders. 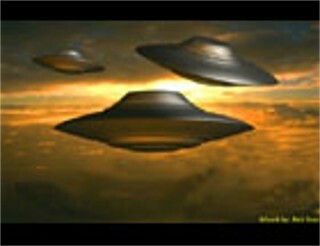 In many countries, continents and cultures people are sharing similar UFO experiences. From Brazil to the U.K, from Mexico to Italy, devoted UFO researchers shared their fascinating and unique experiences, studies and evidence with an American audience. Alien Abductions, Crop Circles, the variations of the ET races on earth, the political influence of ET existence, UFO crashes, Close Encounters with Aliens were some of the topics presented by the investigators. The International UFO Congress also brought together important publishers in the UFO and New Age area, spiritual therapists, healers, the media and contactees as well as abductees. The Jerry Pippin Radio Show team interviewed A.J.Gevaerd, Fredy Silva, Dolores Cannon, Michael Salla PhD, Paula Harris, Dr.Thomas Van Flandern, Paul Davids, Ron Schnible, Gregory and Shelina Thomas, and Robert D.Miles. You can listen to these interviews on this page of our website. Click on the image above for info on the 2006 Conference. In this interview, Jerry talks to Robert Miles (photo, left) about his book, Safe Space, and about the documentary he is filming concerning intelligence briefings. They talk about the speakers and researchers at the conference and how he and his film crew are trying to gather as much evidence as possible concerning UFOs. He discusses why he took on the documentary project, and how he wants this to be a positive, world-wide story with truth, facts and experiences of people of all nationalities. He also discusses his own experiences, which have been life changing, and which made him realize that people have to work together to bring peace, harmony and change to our Planet Earth. Robert is shown below with Jerry and his son Anthony Miles at the conference. Click on the image above to visit Robert's website. Blair Mignacco (photo, on right) has been making the rounds of radio and TV programs talking about the unintended consequences of a comet impact project scheduled to be carried out on July 4, 2005 by NASA. 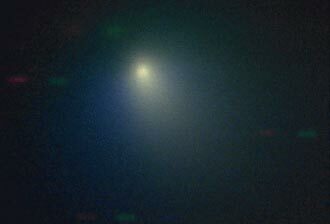 The project It involves shooting a missile into the surface of Comet Temple 1, which is passing through our solar system. Blair and his associate, Jim Law, both from Sedona, Arizona believe the dangers of this action far outweigh any scientific benefits. You may contact Blair at blaircarl@netzero.com. Is there a danger to Earth from this action? Bonnie Meyer (photo, left, front, center) from Wisconsin dropped by our show production desk to tell us about her trip to a giant space ship that circles the Earth. The captain of this ship looked like Big Bird, only he was blue and more human-like, but still a big bird. She says she has had some strange ETs stop by and visit her at her house from time to time. Bonnie's web site is www.thelightside.org. Listen to the interview with Bonnie. Note: changing the images below will stop any audio program you may be playing, so we recommend you listen and look separately. Jerry broadcasting at the UFO Congress. Gerry and Malou Zeitlin, from Oswego, New York, dropped by to watch Jerry's radio program. Jerry Pippin working the audience and taking questions. The audience participating in Jerry's radio programs.